About four and a half years ago, when my girlfriend Laine and I were hunting for our first apartment in Hong Kong, her parents suggested we look in Mei Foo. We refused to even consider it. “It would be like living in a parking garage,” I said. Laine agreed. Lately, though, I have started to rethink my assessment. Mei Foo still has the ambiance of a mid-century New York City housing project built on top of a highway offramp — think Stuyvesant Town without the trees — but there’s more to it than I initially thought. 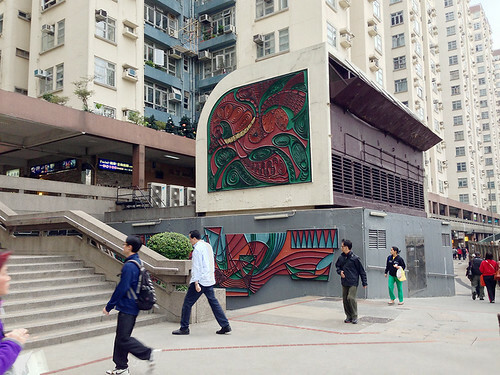 Mei Foo Sun Chuen is located on the site of a former Mobil oil storage facility — its name means “Mobil New Estate” — on the far western edge of Kowloon, where the crowded factories and tenements of Lai Chi Kok gave way to scrubby green hills. 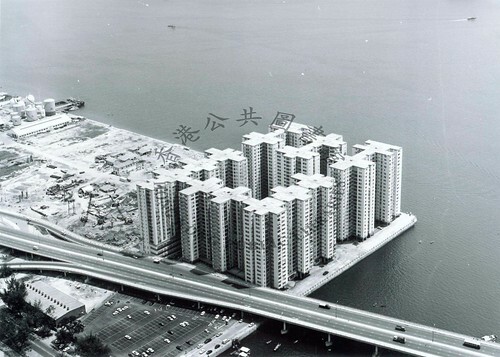 Built between 1965 and 1978, it was Hong Kong’s first private housing estate. It is enormous: 99 towers containing 13,500 apartments, home to 70,000 people. And it’s hard to understate its historical importance; this wasn’t just a housing complex, it was the genesis of modern-day Hong Kong. Mei Foo is Hong Kong’s Levittown: a revolution in how the city was built, managed and perceived. In the mid-1960s, most people in Hong Kong lived in four general types of housing: squalid wooden shanties built on hillsides, vulnerable to fire and landslides; overcrowded walkup tenements in old neighbourhoods like Wan Chai; one of the new public housing estates being built by the government; and for the privileged few, one of the standalone apartment towers mushrooming in the wealthier parts of town. 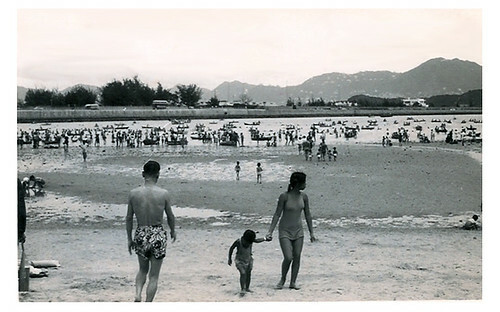 For the growing middle class, Mei Foo provided an alternative: spacious, affordable and newly-built apartments in a relatively convenient location. 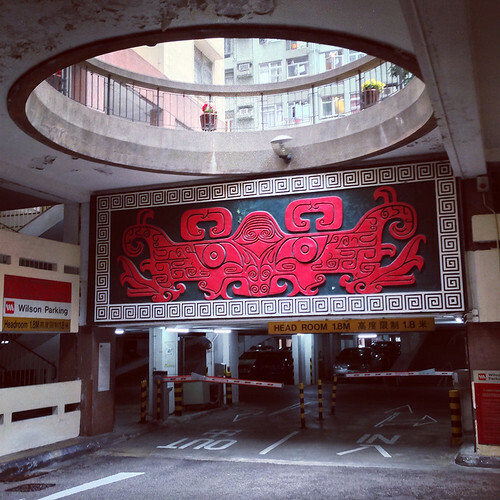 Like many ascendant Hongkongers of the era, Laine’s parents bought their first apartment in Mei Foo; for people who grew up in decidedly modest circumstances, it was a foothold to a better life. Today, Mei Foo has retained much of its original appeal, and along with a few later equivalents, like Taikoo Shing, it is used as a barometer for real estate values. (The current price for a 500-square-foot flat in Mei Foo: HK$4.5 million. In 1965: $40,000.) Yet unlike its successors, something about Mei Foo’s design has allowed it to accrue a certain patina. Taikoo Shing, built in the 1980s and distinguished mainly by the degree to which its towers and shopping malls are indistinguishable, is as bland as ever — suburban, in other words. Mei Foo, by contrast, feels much more urban. That said, I wasn’t kidding when I said it feels like a parking garage. Most of the estate was built on a podium, with open spaces and apartment buildings on top, streets and shops below. An elevated highway runs through the district, adding to the utilitarian feel. 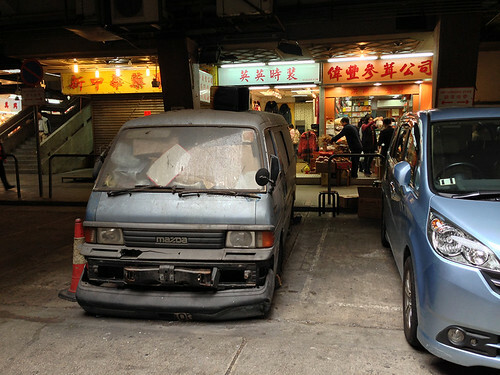 But the warren-like environment gives Mei Foo a certain grimy ambiance that has allowed interesting spaces to emerge. There’s a weekly farmer’s market beneath the highway and a wet market that has sprung up in a dank alleyway nearby, next to a little section of Indonesian and Filipino shops to serve the area’s large population of domestic helpers. The streets have odd names — Broadway, Glee Path, Humbert Street — and they are lit from above by circular skylights, one of which is adorned with a great kitschy piece of 1960s pseudo-art. 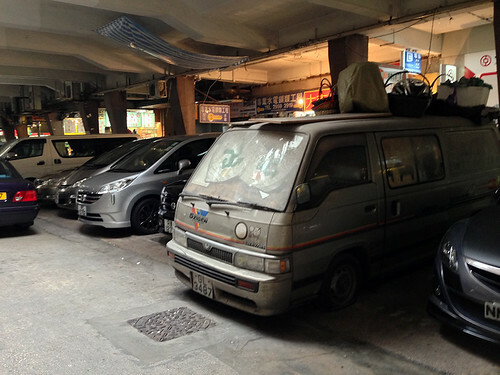 Perhaps strangest of all is the stretch of Glee Path lined by decrepit early-90s Japanese minivans, each of them filled with junk and covered in a few inches of grime. Last time I visited, one van’s roof was being used as a storage space for a nearby greengrocer, with wicker baskets piled high on top. It’s the kind of strange, inexplicable stuff that makes cities interesting — and a sign that Mei Foo, master-planned with 99 identikit towers, has ultimately gained some of the unpredictability and eccentricity that characterizes any urban neighbourhood, regardless of its origins. Mei Foo has become quirky with age. This entry was written by Christopher DeWolf , posted on Friday June 14 2013at 04:06 am , filed under Asia Pacific, History, Public Space and tagged Exploring the City, Hong Kong, Housing, Kowloon, Mei Foo, Streetlife . Bookmark the permalink . Post a comment below or leave a trackback: Trackback URL. Being the Hong Kong movie buff that I am, it’s been intriguing to find out that the likes of Wong Tin Lam (director of “The Mambo Girl” and “The Wild, Wild Rose” who may be best known to contemporary folks as Wong Jing’s father) and Roger Lee (the producer who Andy Lau’s “A Simple Life” character is based on) were/are residents of Mei Foo. Yes, you’re right. I’m kind of surprised that more movies haven’t been shot there. It certainly lends itself to film.